The alleged gang members pleaded not guilty in the killings of Josue Amaya Leonor and Angel Soler in 2016 and 2017, prosecutors said. Two alleged members of the MS-13 street gang were arraigned on grand jury indictments Friday in connection with the slayings of a 15-year-old boy and a 19-year-old man who investigators said were hacked to death in 2016 and 2017 because they were perceived to be enemies of the gang, officials said. 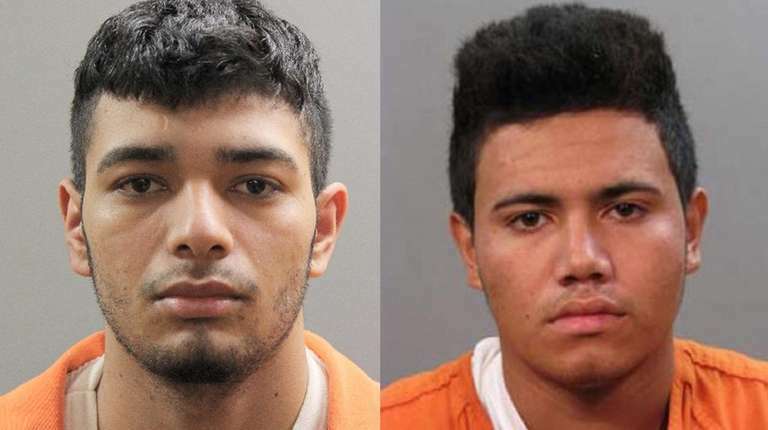 Josue Figueroa-Velazquez, 19, and Kevin Lopez-Morales, 21, pleaded not guilty when they were arraigned before Acting Supreme Court Justice Patricia Harrington on two counts each of second-degree murder, Nassau County District Attorney Madeline Singas' office said in a news release. They were held without bail until their next court date, scheduled for Nov. 14 for Figueroa-Velazquez and Nov. 15 for Lopez-Morales. The crimes are punishable by a maximum prison term of 25 years to life. Nassau police arrested Lopez-Morales on Sept. 6 and Figueroa-Velazquez on May 29. Prosecutors said both Figueroa-Velazquez and Lopez-Morales took part with other alleged MS-13 members in the Sept. 4, 2016, killing of Josue Amaya Leonor, 19, who was struck and stabbed with a machete. His body was found in May 2018 in a wooded area of the Roosevelt Preserve. Jose Daniel Lopez, 19, another alleged member of the gang, pleaded not guilty at his arraignment on an indictment on the same homicide on Sept. 6, officials said. Figueroa-Velazquez and Lopez-Morales are also charged in a similar fatal attack on Angel Soler, 15, on July 21, 2017, officials said. Soler’s mutilated body was found under cement in October 2017 in a remote wooded area in Roosevelt near the Southern State Parkway, prosecutors said. Three other alleged members of the gang, David Sosa-Guevara, Victor Lopez and Dennis Lopez have already been indicted in that case, officials said.